Avocado Deviled Eggs are a healthy spin on classic deviled eggs. 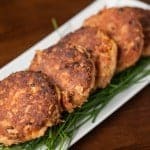 Great for parties or a protein filled keto-friendly snack – you’ll love them! 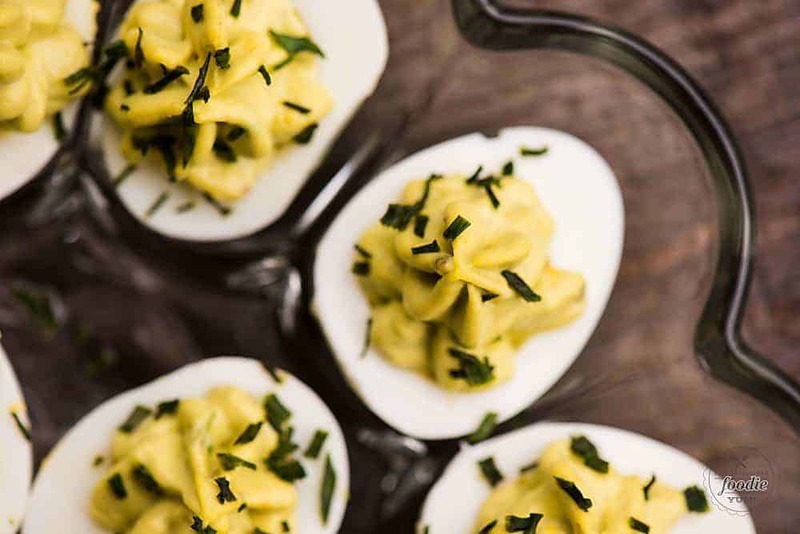 Avocado Deviled Eggs are the kind of snack or two bite appetizer that people go crazy for. I know this because I just made them for a little party at my house and people did just that – go crazy for them. 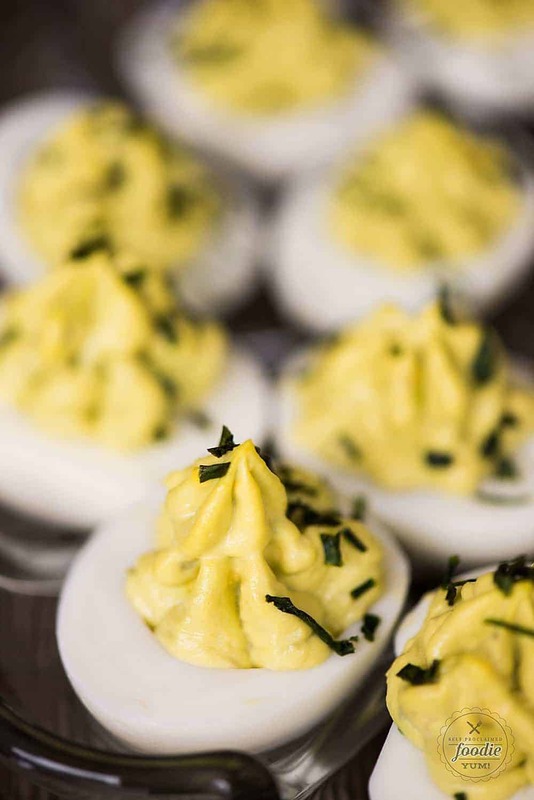 When I told my guests these deviled eggs were made the classic way – with mayo and mustard – and I just threw in a ripe avocado, they couldn’t believe it! 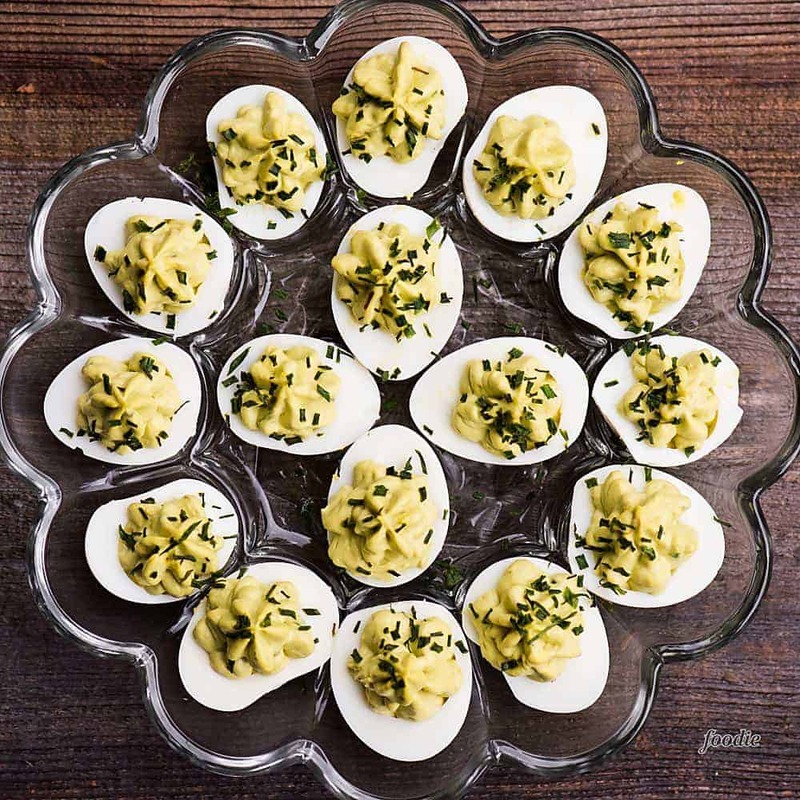 I’m no stranger to deviled eggs, but I can tell you I like to mix it up and create all kinds of different deviled egg recipes. I’ve made them with bacon and jalapeno (of course), Peperoncini, Sriracha, and green chile. Now that I have 22 chickens walking around my backyard and laying the most beautiful fresh eggs, you better believe you’re going to see a lot more deviled egg recipes on my blog! First and foremost, you must perfect your hard boiled egg making technique. The very first post I put on my blog was how to hard boil an egg. This has been something I’ve always struggled with, but I thought I had perfected it so I documented the process for my readers. I have since been using the pressure cooker, or Instant Pot, to cook my hard boiled eggs. One cup of water and 12+ eggs in a single layer on the rack. 7 minutes on low pressure, then straight into an ice bath – perfection! I have heard that older eggs are easier to peel, but since I have the freshest of the fresh eggs, I have to make due with what I have. I tell you, that pressure cooker method works fantastic. Next tip to achieve the very best deviled eggs comes with the peeling. It doesn’t matter if you cook your eggs perfectly if you make a mess of them when you remove the peels. 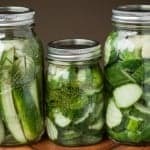 A little tip I shared with my readers in my newsletter is my new peeling trick! Here it is… After you boil your eggs and immediately transfer them to an ice bath, start by removing the shell on the bottom, or the non-pointy, end. There is typically an air pocket around there and the shell comes off easily. Then, hold the egg under running water with the open part facing up. Gently squeeze to create a pocket in between the egg and the membrane and let the running water get in there. The peel will then pull away like magic! 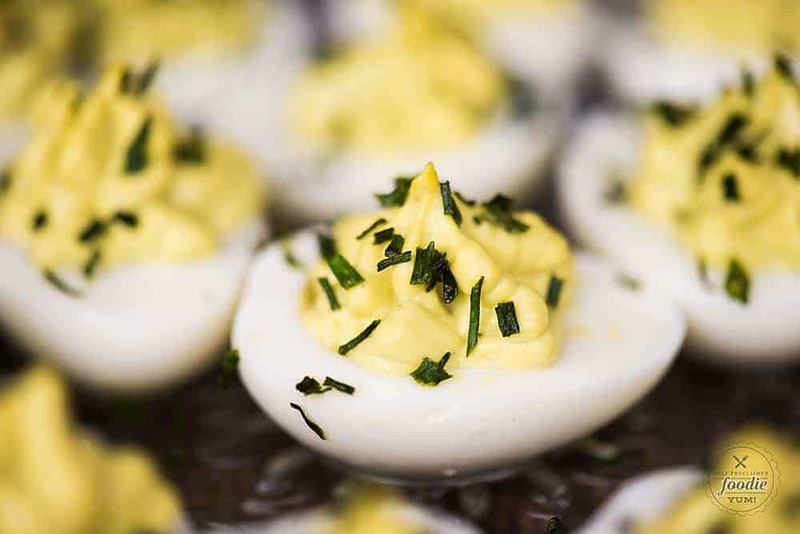 You can’t claim you’re making the best deviled eggs without an amazing filling, right? I’ve made plenty of deviled eggs with no mayo and have used substitutes like yogurt or even dairy free alternatives like mustard or pure avocado, but I’m a fan of the mayo. And if you use a mayo made with avocado oil, your deviled eggs will be paleo friendly. No matter what you choose to add to your deviled egg filling, you just want to ensure that it is a) well seasoned and b) smooth and creamy. These avocado deviled eggs are just that. Let’s talk presentation, shall we? There are a lot of ways to get your yolk mixture back into the egg white. You can simply use a spoon, but I tend to go for a prettier look. My preference is to transfer it to a ziplock bag and snip off the corner, or if I want to be extra fancy, I fill a piping bag with a star tip. I highly recommend serving up your avocado deviled eggs, or any deviled eggs for that matter, on a deviled egg platter. If you’ve never made deviled eggs before, they’re slippery little things and the platter keeps them looking beautiful. I always make extra, store them in the frig, and keep refilling the platter on demand. Finally, all good food deserves a nice garnish. I was tempted to top my avocado deviled eggs with bacon because who doesn’t love bacon, after all? 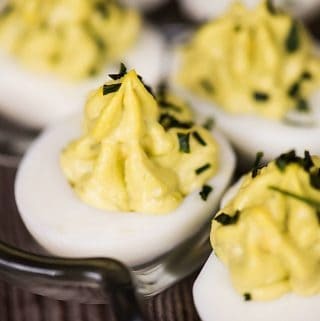 I even had a few friends at my party following a strict keto diet, and even though these deviled eggs were keto friendly, they wouldn’t have turned down bacon. Alas, I decided to keep these avocado deviled eggs vegetarian and just top them with some minced chives. Avocado Deviled Eggs are a healthy spin on classic deviled eggs. 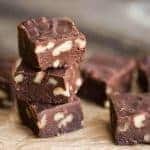 Great for parties or a protein filled keto-friendly snack - you'll love them! Slice hard boiled eggs lenghwise. Remove yolks and add to bowl. Combine mayonnaise, mustard, and avocado with egg yolks. 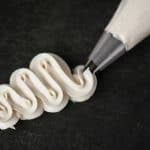 Use a stand mixer with the paddle attachment to whip or even a fork will due. Season with salt and pepper to taste. Spoon or pipe yolk mixture back into the egg whites. Garnish with chives, if desired. Serve cold. Makes 24 deviled eggs. Serving size = 2 deviled eggs.